Bring your lemonade up a notch by adding peach syrup & ripe peaches to the mix. 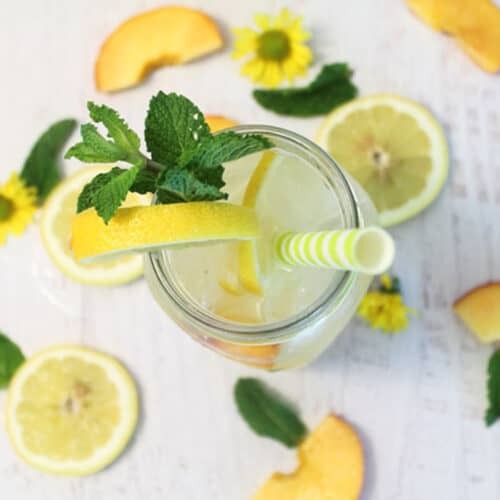 Nothing is better to quench your thirst on a hot summer days than a refreshing peach lemonade. In a medium saucepan, mix together chopped peaches, sugar and 1 cup water. Place over medium heat and bring to a boil, turn down and simmer for 5-7 minutes. Remove from heat and mash peaches. Strain liquid and any peach pulp you can push through strainer then discard peach skins. In a large pitcher, combine 4 cups of water, lemon juice and ice. Pour peach syrup into lemonade and stir. Place in refrigerator until ready to serve. To serve: Place peach slices, lemon slices and a few mint sprigs into pitcher. Fill tall glasses or mason jars with ice and garnish with another lemon or peach slice and a sprig of mint.